In South Africa the South African National Biodiversity Institute (SANBI) acts as the National Implementing Entity (NIE) to the Adaptation Fund (AF). SANBI is therefore responsible for vetting and endorsing project and programme proposals, and for disbursing funding from the AF when proposals are successful. The NIE is also responsible for the overall management of funded projects and programmes, and thus for reporting, financial and monitoring aspects. The NIE Secretariat is housed within SANBI’s Climate Change Adaptation Directorate and Mandy Barnett, the NIE Executive Director is the contact person. Since the project inception in October 2015, The Executing Entity and Facilitating Agencies have had several meetings with the local community representatives to develop small grants projects in the Namakwa and Mopani Municipal Districts. Briefing sessions were held in both districts and over 60 concepts were received and reviewed. On 07 November 2015, short listed applicants were endorsed with a request for further development of their proposals. The applicants are in the process of further developing their proposals for submission. After the approval of the two NIE projects in 2014, the Minister of Environmental Affairs Hon Ms. Edna Molewa officially launched the Adaptation Fund’s projects earlier this year. Both projects are gearing up for official implementation during the fourth quarter of 2015. The Community Adaptation Small Grants Facility will be implemented in the Namakwa District Municipality by Conservation South Africa and in the Mopani District Municipality by Choice Trust. The project aims to empower community level stakeholders to identify, develop and implement adaptation response projects through direct access to funding. During the first half of 2015 the Small Grants Facility established a Project Advisory Group to formulate governance structures and administrative arrangements, which are currently in the final stages of completion. Once the governance structures and administrative arrangements are in place, the Small Grants Facility will be ready to accept adaptation proposals from non-governmental and community based organisations within the Mopani and Namakwa District Municipalities. Before the application process commences, a local briefing session by the Facilitating Agencies is planned for each District Municipality. Set for the fourth quarter of 2015, the briefing session will ensure that interested applicants are well informed and capacitated to take advantage of the opportunity to bring sustainable and concrete adaptation mechanisms to their communities. In addition, potential applicants will also be guided through the project review and acceptance process. 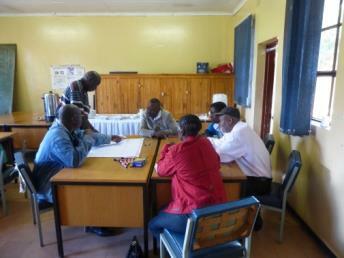 Further planning also includes environmental and social safeguard training before project implementation. The uMngeni Resilience Project will be implemented in the in KwaZulu-Natal by the facilitating agency, uMgungundlovu District Municipality. The overall aim of the project is to increase the resilience to climate change impacts by vulnerable communities through combining traditional and scientific knowledge in an integrated approach to adaptation. During the first half of 2015 the Project Management Unit (PMU) was established and will be responsible for ensuring that the project funds are used efficiently towards the deliverables and targets set out in the project proposal, coordination of all components of the project and to ensure that there is compliance with the requirements of the National Implementing Entity and the Adaptation Fund. The Project Manager for the unit has been appointed. The project launch is due for the last quarter of 2015 and various project pre-inception activities have taken place. These include site visits and workshops to develop detailed project implementation plans. A due diligence process was conducted by SANBI during August 2015 to determine alignment with the Adaptation Fund requirements. This included reviewing the procurement systems & procedures, financial management systems and technical reporting systems of each partner. Further project planning for 2015 includes establishing the governance structures and processes for the project, training of project personnel on environmental and social safeguards and further staff appointments for the PUM. After a comprehensive project development process which culminated in both NIE projects being submitted as fully developed proposals, the Adaptation Fund Board approved both South African projects. The first approved project “Building resilience in the greater uMngeni catchment, South Africa” (US$ 7,495,055) aims to increase resilience of vulnerable communities through interventions such as early warning systems, climate smart agriculture and climate proofing settlements. This project will be led by the uMgungundlovu District Municipality. The second approved project “Taking adaptation to the ground: a small grants facility for enabling local level responses to climate change in South Africa” (US$ 2,442,682) will develop and implement a small grant finance mechanism in the context of climate finance, to deliver direct and tangible adaptation benefits with a view to scaling up and replicating this model. This project will be led by SouthSouthNorth and Conservation South Africa, and will be implemented in the Namakwa and Mopani Districts in Northern Cape and Limpopo Provinces respectively. The next few months will see SANBI and the partners who will be leading the projects convening launch events and inception workshops, and preparing for project implementation, which is due to start in mid 2014. Further updates will follow as soon as more information is available. The full proposal for the largest project, “Building Resilience in the Greater uMngeni Catchment,” is currently being finalised under the lead of the executing entity of the project, the uMgungundlovu District Municipality (UMDM) in KwaZulu Natal, in collaboration with the NIE and local stakeholders. A key component of the work over the past few months has been the stakeholder consultation process taking place at various levels. The project proposal development team has been engaging with national, provincial, municipal as well as local actors, building support and relationships. This will ensure that the project proposal will be accompanied by a good number of endorsement letters from a variety of stakeholders. More importantly, the process of engagement works to ensure broad ownership as well as ensuring that the initial foundation required for project implementation is established. The full proposal for the second project, “Taking adaptation to the ground: A Small Grants Facility (SGF) for enabling local level responses to climate change,” is currently being developed by the NIE together with the local partners. 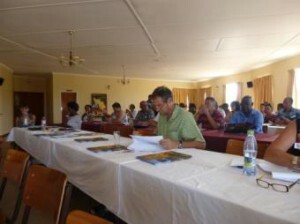 In Namakwa District Municipality, one of the two SGF sites, a large stakeholder workshop was organised in mid-February by the Namakwa facilitating agency, Conservation South Africa. The workshop provided an opportunity for stakeholders to learn more about the project and give input, and further enabled the project proposal development team to get insights from the stakeholders on local vulnerabilities and possible adaptation responses. In Mopani District Municipality, the second of the two SGF sites, the project proposal development team has been working closely with the District Municipality. With support from actors in the District Municipality, the team has been working to map out the stakeholders active in the District and to get a better understanding of local vulnerabilities. This process is ongoing, and comprises engagements with organisations and local government officials, as well as a number of small workshops to collectively assess the local vulnerabilities. The project proposal development work that is taking place for both projects reflects how building large projects with a variety of stakeholders requires time and flexibility. Yet while the process is time consuming, the general feeling from the project proposal development teams is that the local buy in and the building of new relationships and foundations for implementation is invaluable.